This tray can hold two Stonehorns or Thundertusks and four Mournfang Cavalry. 7 inch (178 mm) thick tray. 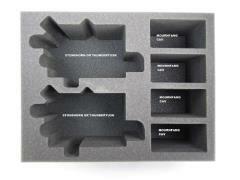 Due to the size of these models, this tray will have a line where multiple foam trays will be assembled together.